Sour Grapes is the first feature-length documentary about Rudy Kurniawan, the enigmatic wine forger who duped collectors out of millions of dollars. In 2013, when Kurniawan was sentenced to 10 years in prison, many questions were left unanswered, about the fraud and about Kurniawan himself. 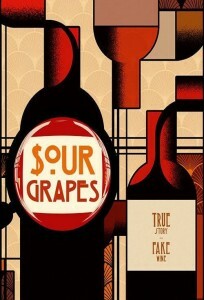 Sour Grapes doesn’t have all the answers, but it does give those of us who followed the story closely some closure regarding the nature of the man. Hands down the best thing about Sour Grapes is the ample footage of Kurniawan. We get to hear him speak, see him interact with others, and even bid on wine. At one point, mid-auction, he chuckles, “Dude, I just opened that bottle on Thursday. Can I refill it? Put the cork back in?” (Seriously! He actually says that!) That’s something no amount of Wine Spectator articles can give you. But the film isn’t just about Rudy. It’s a drama with a full cast. There’s Bill Koch, the billionaire wine collector who fell victim not only to Rudy but also Hardy Rodenstock, the villain forger with the punchable face featured in Benjamin Wallace’s 2009 book The Billionaire’s Vinegar. In Sour Grapes, Koch comes across as an endearing lover of wine and likeable crusader against wine fraud. Then there’s John Kapon, CEO of storied auction house Acker Merrall & Condit, who plays the unwitting accomplice in Kurniawan’s ruse. Kapon is a parallel to Michael Broadbent, the Christie’s auctioneer from the Rodenstock story. Sour Grapes does, however, allow Kapon to redeem himself, noting that Kapon has refunded many of the Kurniawan victims. Rounding out the cast is Laurent Ponsot, proprietor of Burgundy’s Domaine Ponsot and the man credited with discovering Kurniawan’s fraud. Like Koch, Ponsot is an impassioned crusader. He did some serious traveling and investigative work before finally outing Kurniawan. He’s even been lionized for rising to his feet at an auction and publicly withdrawing a lot of Ponsot bottles he believed to be counterfeit. You root for him too. Sour Grapes is a highbrow version of the television show American Greed’s coverage of the Kurniawan case (which I also recommend highly). But what makes Sour Grapes so much better is, again, the footage of Rudy. More than anything, it’s a fascinating character study. Kurniawan isn’t just an ordinary guy who had an “elegant hustle,” as it’s called in the film; he actually has a preternatural ability to taste wine. His friends describe him as fun, generous, and genuinely gracious. It’s simply a case of a talented and likeable individual choosing to use his talents selfishly. Sour Grapes is a must watch for anyone who followed the Kurniawan case, and just as much so for anyone interested in modern scandals of the upper set. And hey, it’s coming to Netflix this month!